Caring for a person with dementia can be an overwhelming experience. We provide support, including emotional support, assistance with day-to-day caring and access to respite care. If you are a caregiver or member of the public and need help or information about dementia, please call us or contact us. Our Helpline 6377 0700 is open Mondays to Fridays, 9am to 6pm. Our Caregiver Support Centre runs support groups in English, Mandarin and Malay for caregivers looking after people with dementia. The meetings begin with a talk on dementia-related topics given by various specialists. Following the talk, there will be a facilitator-led discussion session for the caregivers, in which difficulties in looking after their family member with dementia can be brought up and solutions worked out. The English Caregiver Support Groups are conducted at various locations on weekdays and Saturdays. There are also Mandarin Caregiver Support Groups on Saturdays. Interested in joining our Caregiver Support Group sessions? 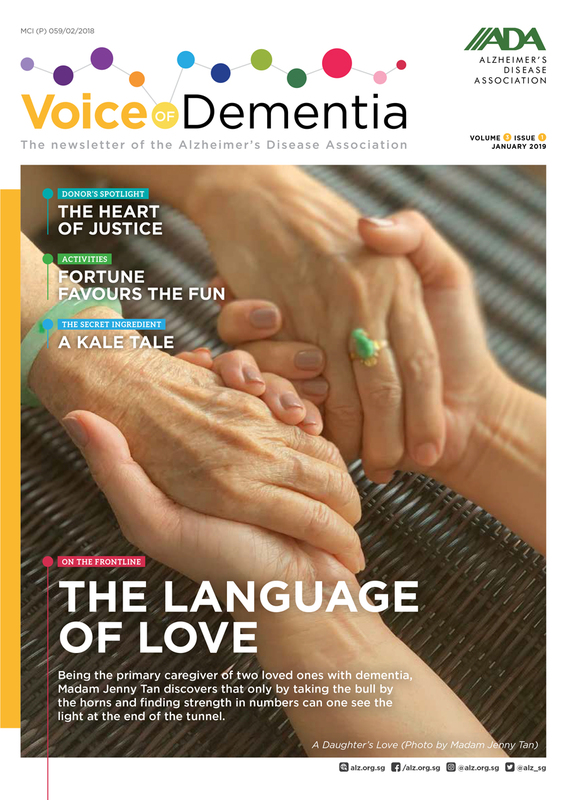 Simply register online or call our Dementia Helpline 6377 0700. Please note that these Caregiver Support Groups are strictly for family caregivers caring for people with dementia. Click here to download a copy of our Caregiver Support Groups brochure (October 2018 to March 2019). We provide helpline counselling services for caregivers looking after persons with dementia. Be assured that all information is kept strictly private and confidential. Face-to-face consultation is also available by appointment, to provide an avenue to discuss the issues further and explore options available that may aid in coping with the challenging situations faced. Lastly, check out our comprehensive directory of assistance you can get from us and our partners.